Disappear to a place where times stands still and nature takes centre stage, as we present 6 luxurious safari-style bungalows, nestled around the lake of our spectacular 320-acre, certified organic olive farm, in Cowaramup, Margaret River. Designed for minimal environmental impact and maximum comfort - each bungalow boasts a private en-suite, kitchenette, spacious viewing deck and bespoke interiors. Surrounded by undulating natural landscape, abundant wildlife and more than 8000 olive trees, it’s all about getting back to basics, without having to rough it! We invite you to wander through the olive groves, enjoy a long lunch in the Café, sample our oils and organic beauty products - or simply sit back on your private deck and watch the sunset as it rolls in across the lake. Be inspired by the vision of this organic and sustainable retreat from the rest of the world. Ahh the serenity...a wonderfully relaxing experience. The "tent" was clean, tidy and invoked a sense of luxury. Breakfast was a delight, as was the Cafe. The lake walk was enjoyed several times. Trinity, the resident dog, made us smile. All the staff were freindly and helpful. Recommend this to all and look forward to doing again. Everything was amazing, was such a great experience staying here & our 2 year old absolutely loved it! Better than most hotel rooms but still had the ‘camping’ experience! Lovely rooms, glamping is an understatement, these are luxury bungalos. Breakfast was lovely. Staff very friendly. Close to many winaries and breweries and the town of margaret river. Absolutely fantastic stay. Our breaths were taken away the moment we arrived, and we absolutely loved our 4 night stay. Where do we even begin? The "tent" was luxurious and comfortable. Nice plush beds and large living space for my 2yo to run around. It was well-equipped, with a microwave, sink, and refrigerator. The fireplace provides enough warmth on a cold winter's night too. Getting the breakfast package meant we don't have to worry about preparing or buying breakfast the night before. The breakfasts were huge every morning, with juice, breads, yogurt, granola, fruits, milk, and porridge that you can heat in the microwave.The location was brilliant. We had the tent that faced the lake and waking up to that view every morning was just magical. The area was also very suitable for kids to run around and play, even in winter. At night it was mostly pitch dark and it was fun to explore near the tent with torchlights especially for kids who have lived in the city all their lives. The campfire right outside the tent was also a very nice touch. Sitting there starring at stars is a magical experience.I also highly recommend ordering dinner in on one or two nights. The pasta from the kitchen is just excellent. Having nice warm pasta topped with excellent olive oil from the farm, sitting next to a warm fireplace, starring out at the lake during sunset- that feeling can't be expressed in words. You have to experience that yourself.We highly recommend this and will DEFINITELY be back. Wonderful. Bit chilly but the fire is lit and the heater on. Gorgeous location and wonderful decking over looking the lake. 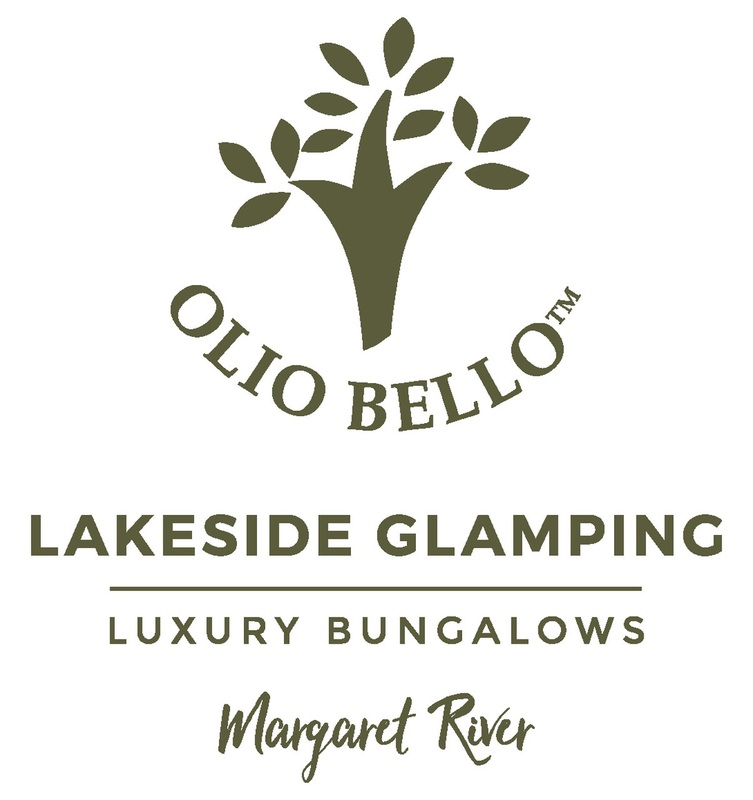 Olio Bello is located approximately 3 hours (270 kilometres) drive south of Perth City. Take the Kwinana Freeway south out of Perth, which will become the Forrest Highway. Follow the signs to Bunbury and then to Busselton, travelling via the Bussell Highway. At the Busselton roundabout turn left onto the Busselton Bypass, following the signs for Cowaramup and Margaret River. At the Vasse roundabout proceed straight ahead, following Bussell Highway through Cowaramup and continuing south a couple of kilometres until you see the signpost for Cowaramup Bay Road. Turn right onto Cowaramup Bay Road and travel approximately 8 kilometres before turning left onto Armstrong Road and arriving at Olio Bello.